See the end of this post for related links! 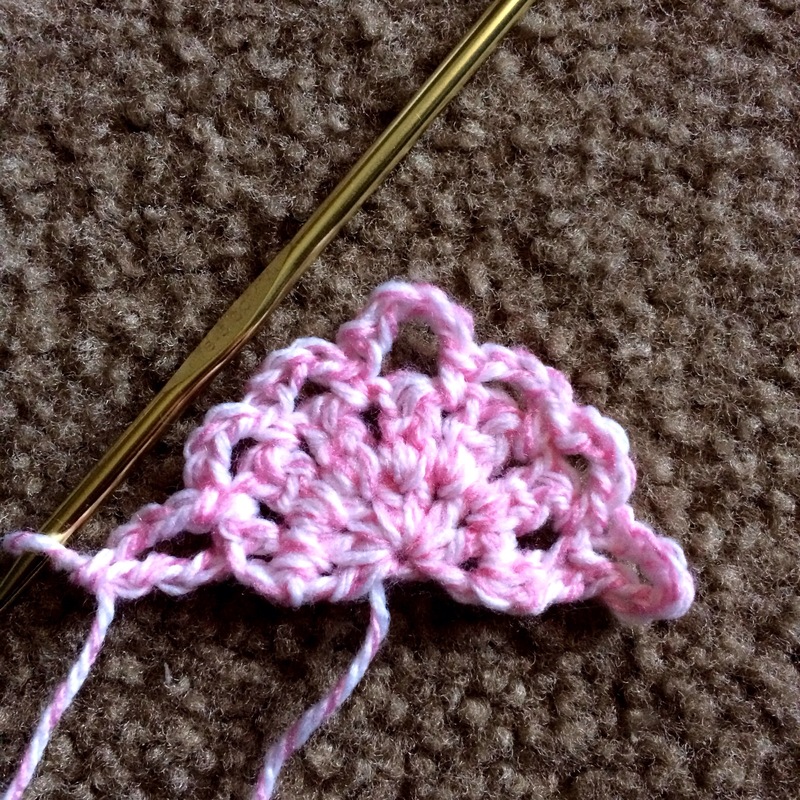 DC Cluster: In the same stitch, work 2 DC stitches up to the final step, leaving behind a loop each time. 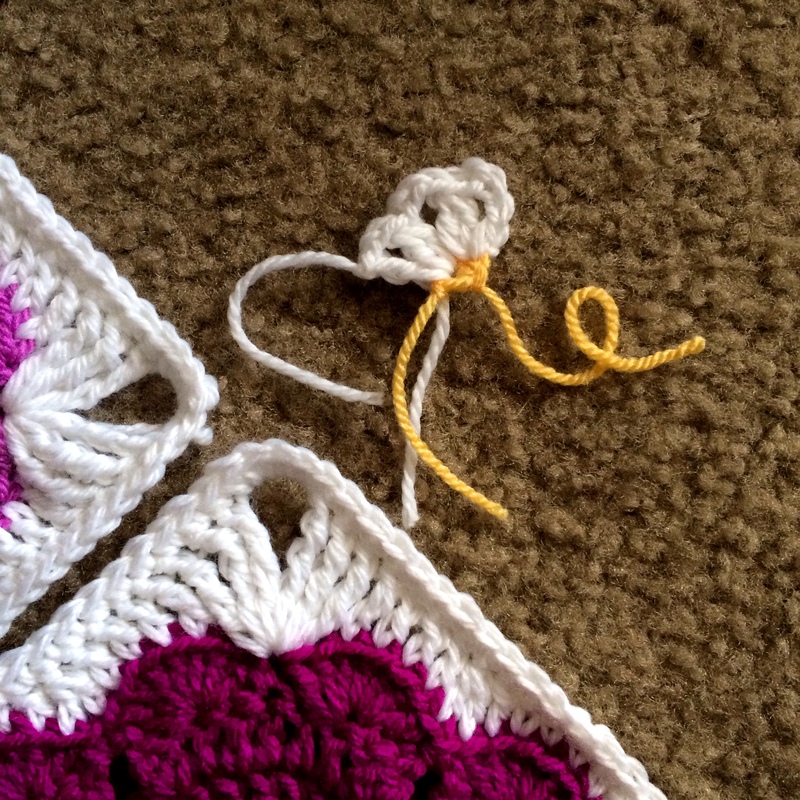 YO and draw yarn through all 3 loops on hook. 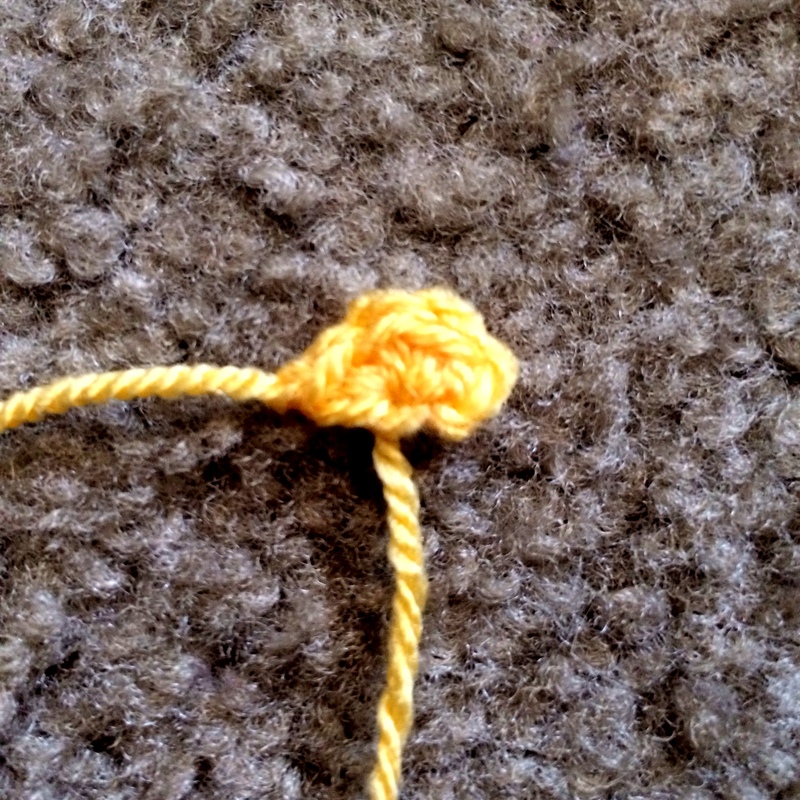 TR Cluster: In the same stitch, work 3 TR stitches up to the final step, leaving behind a loop each time. 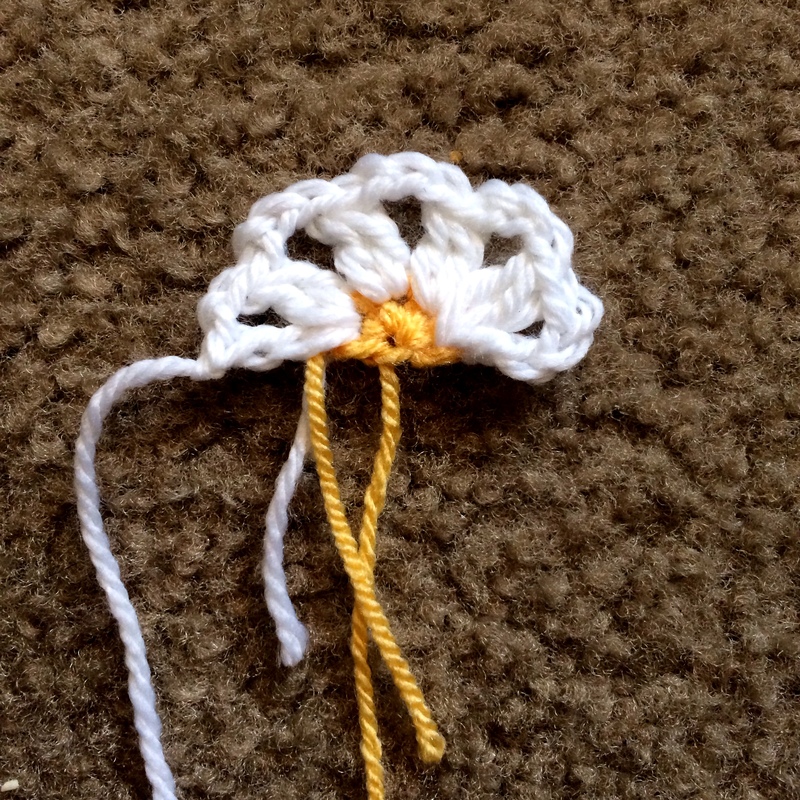 YO and draw yarn through all 4 loops on hook. 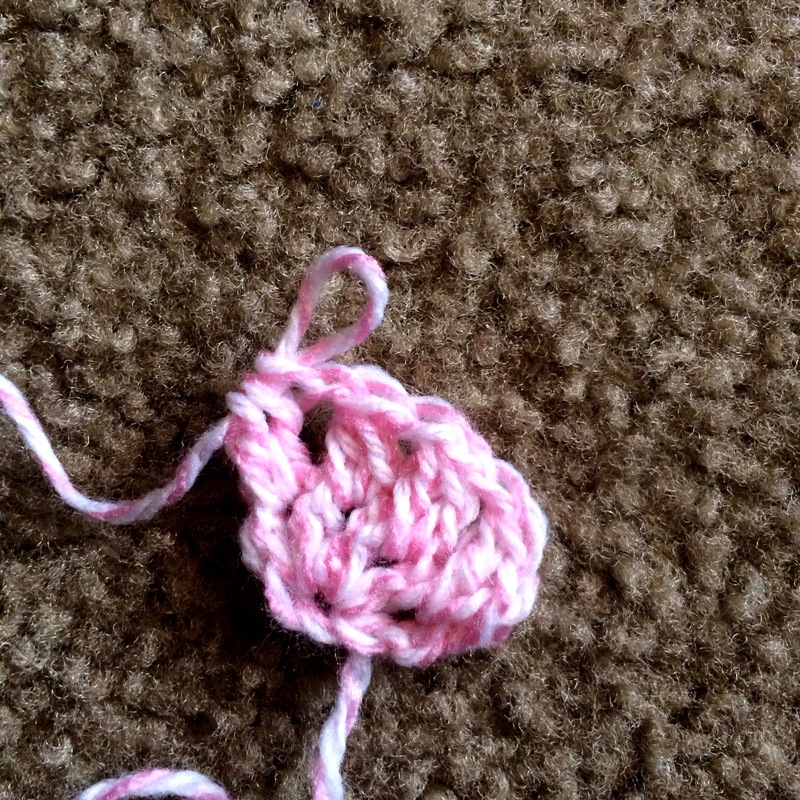 Row 1: 2 SC in Ring, cut yarn and finish off. 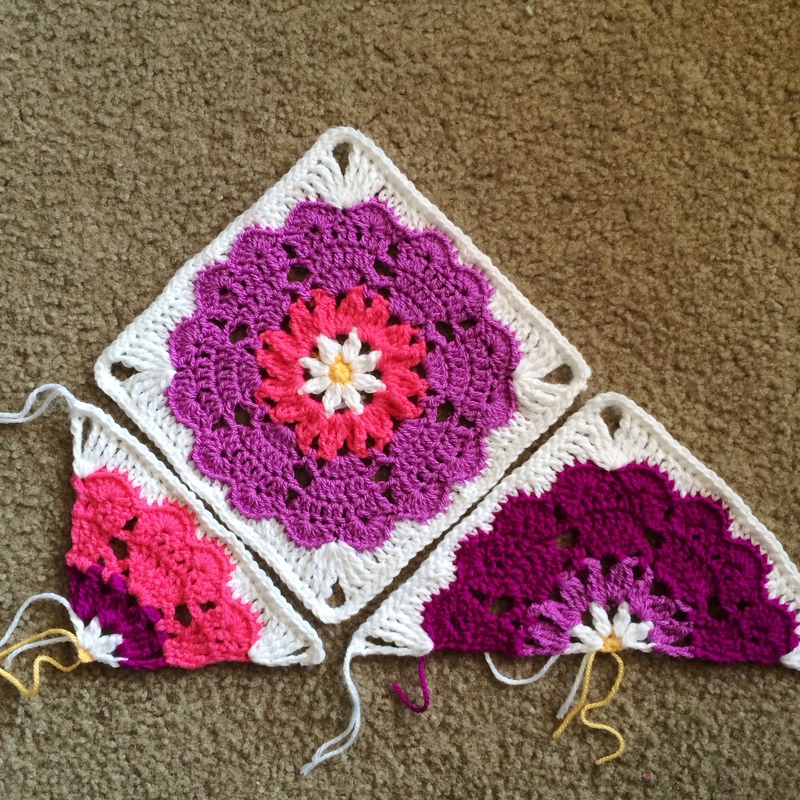 Row 2: Join new color in first SC with Row 1 facing up. (SC, Ch-2, DC Cluster) in same stitch. Ch-3, DC Cluster, Ch-2, DC in same stitch as final DC cluster, cut yarn and finish off. 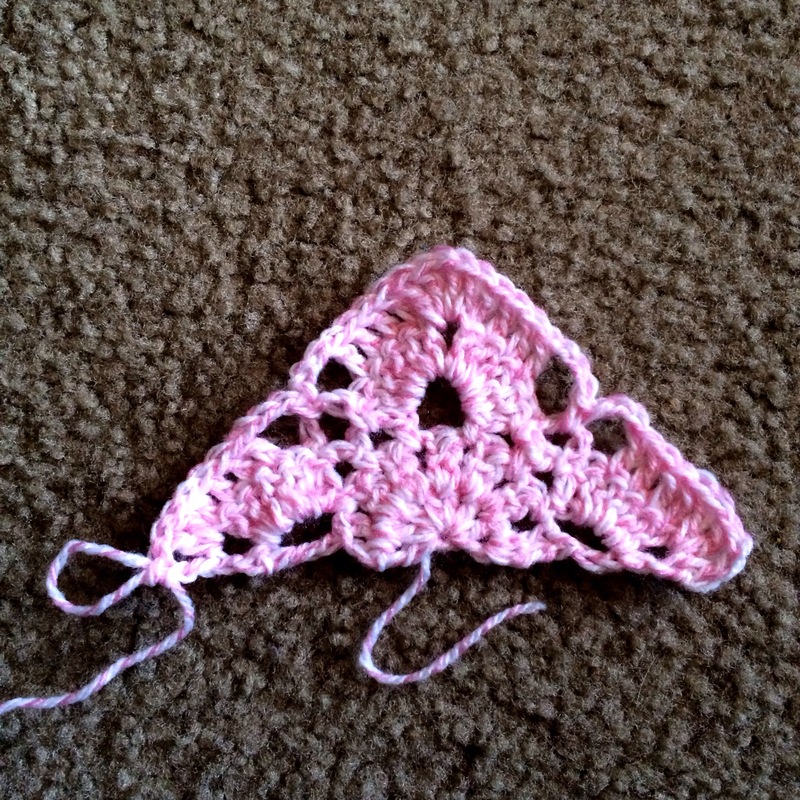 Row 3: Join new color in first chain of beginning Ch-2. 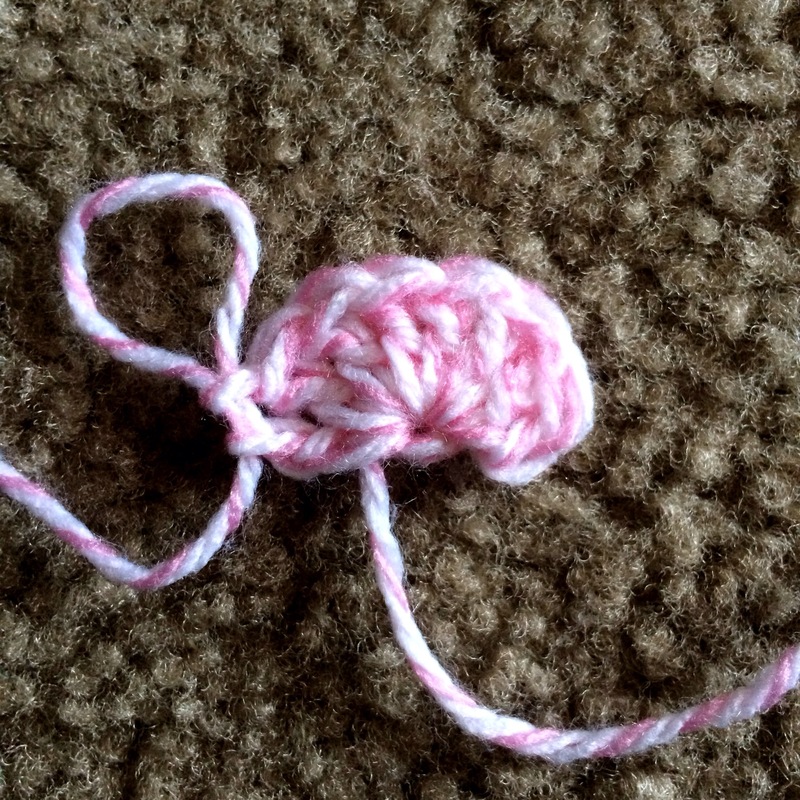 (SC, Ch-4) in same stitch, (TR Cluster, Ch-3) in first chain space. (TR Cluster, Ch-2, TR Cluster, Ch-3) in next chain space, TR Cluster in final chain space, Ch-2, TR in final DC of Row 2, cut yarn and finish off. TURN WORK. 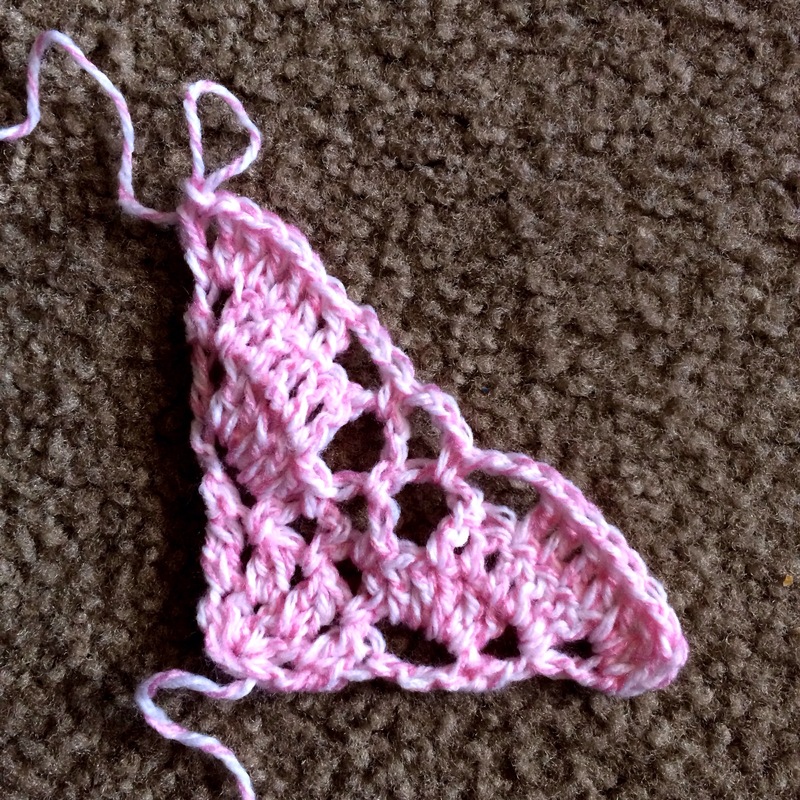 Row 4: Join new yarn in second chain of Ch-4 space of Row below. (SC, Ch-1) in same stitch, 2 DC in first chain space, (Ch-2, SC in next chain space, Ch-2, 5 DC in next chain space), Ch-2, SC in next chain space, Ch-2, 2 DC in final chain space, DC in final stitch. Turn work. Row 5: SC in first stitch, Ch-1, DC in next 3 stitches, (Ch-2, 2 DC in next DC, DC in next 3 DC, 2 DC in next DC), Ch-2, DC in next 3 DC, DC in final stitch. Turn work. Row 6: SC in first stitch, Ch-1, DC in next 4 stitches, (Ch-2, 2 DC in next DC, DC in next 5 DC, 2 DC in next DC), Ch-2, DC in next 4 stitches, DC in final stitch. Turn work. Row 7: SC in first stitch, skip 1 stitch, 7 DC in next stitch, (SC in Ch-2 space, skip 2 stitches, 7 DC in next stitch, skip 1 stitch, SC in next stitch, skip 1 stitch, 7 DC in next stitch), SC in Ch-2 space, skip 2 stitches, 7 DC in next stitch, skip 1 stitch, SC in final stitch. Finish off. 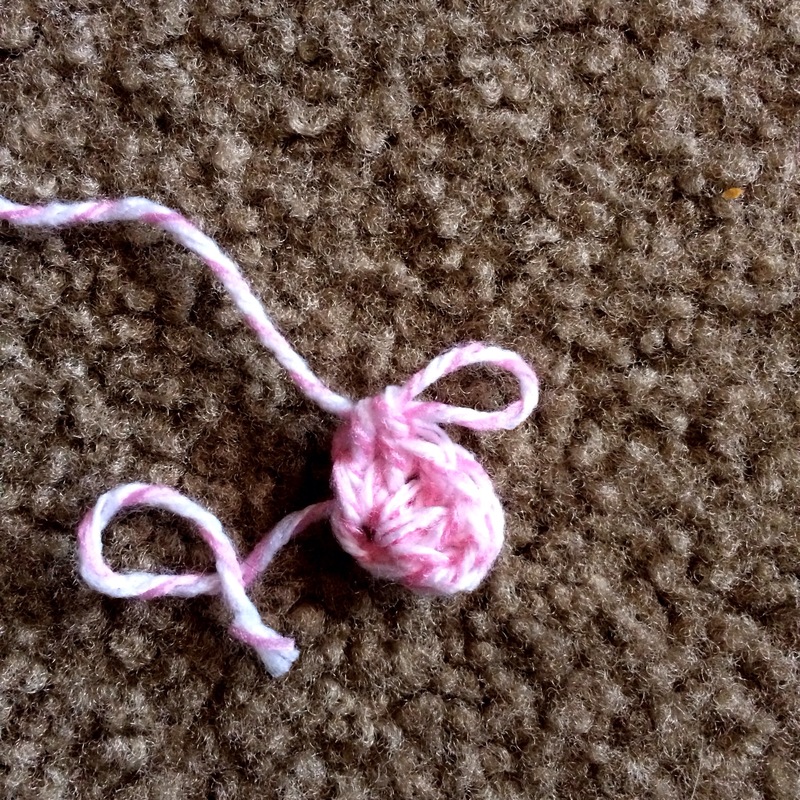 DTR stitch: Wrap yarn around hook 3 times. YO and pull through 2 loops on hook until all loops are used (4 times total). 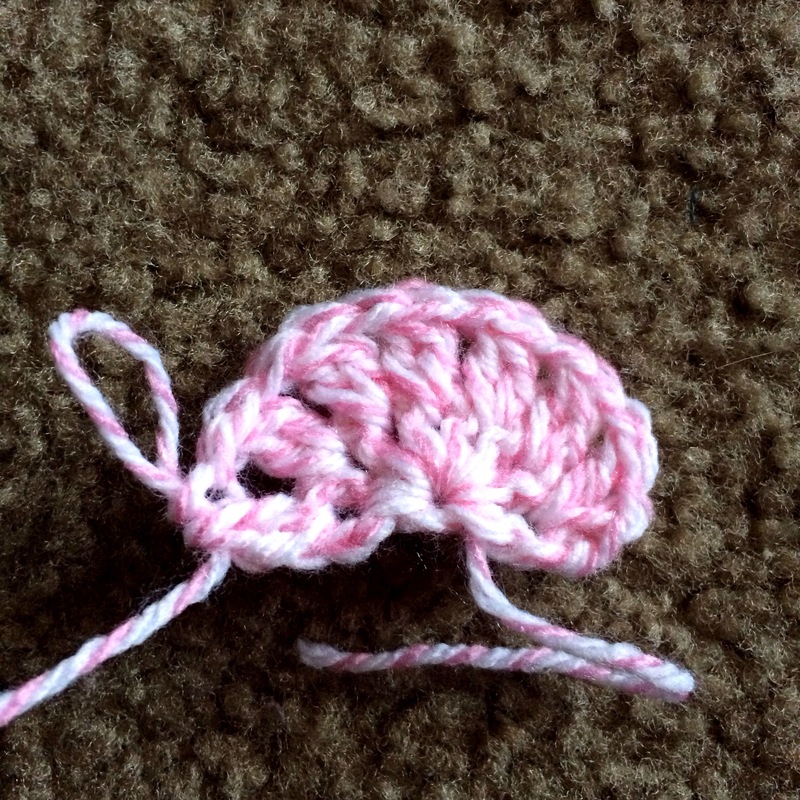 2DCdec: Make a DC cluster, but instead of working both “legs” in the same stitch, work them in the two stitches indicated. With right side facing up, attach background color in first SC. Ch-5, 3 DTR in same stitch, skip 2 stitches, ***TR in next stitch, DC in next 3 stitches, 2DCdec over last stitch of this shell and first stitch of next shell. DC in next stitch, SC in next 4 stitches, 2SCdec over last stitch of this shell and first stitch of next shell, SC in next 4 stitches, DC, 2DCdec as before, DC in next 3 stitches, TR, skip 2 stitches, (3 DTR, Ch-2, DTR) in final SC. Cut yarn and finish off. 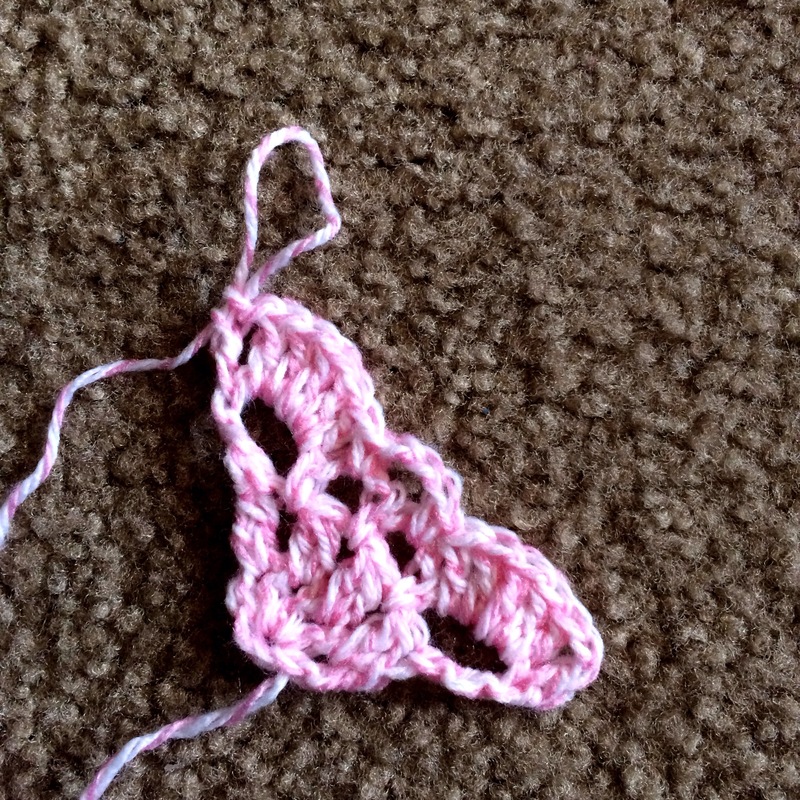 Check out the original motif by the talented Crochet_Millan! See the pattern for the original squared off version of this mandala. And the Half-Square motif too! 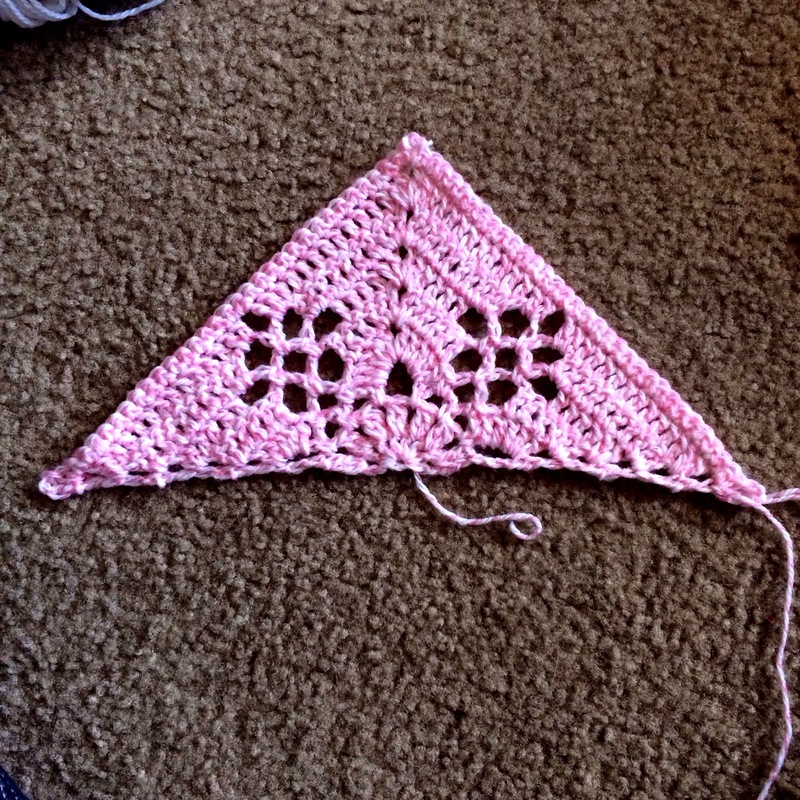 Row 1: 4 SC in Ring, cut yarn and finish off. 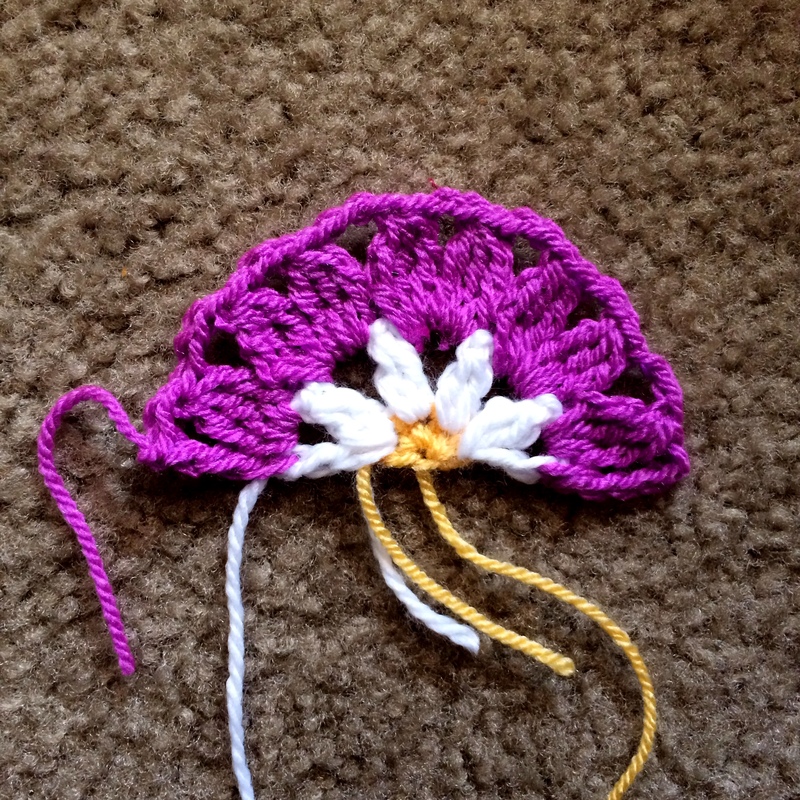 Row 2: Join new color in first SC with Row 1 facing up. (SC, Ch-2, DC Cluster) in same stitch. (Ch-3, DC Cluster) 3 times, Ch-2, DC in same stitch as final DC cluster, cut yarn and finish off. 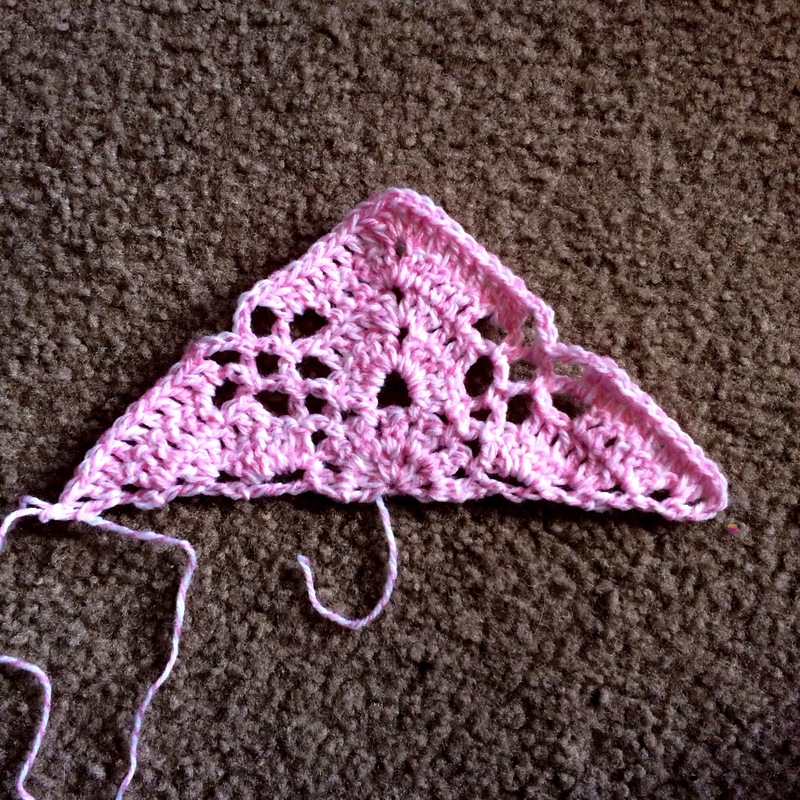 Row 3: Join new color in first chain of beginning Ch-2. 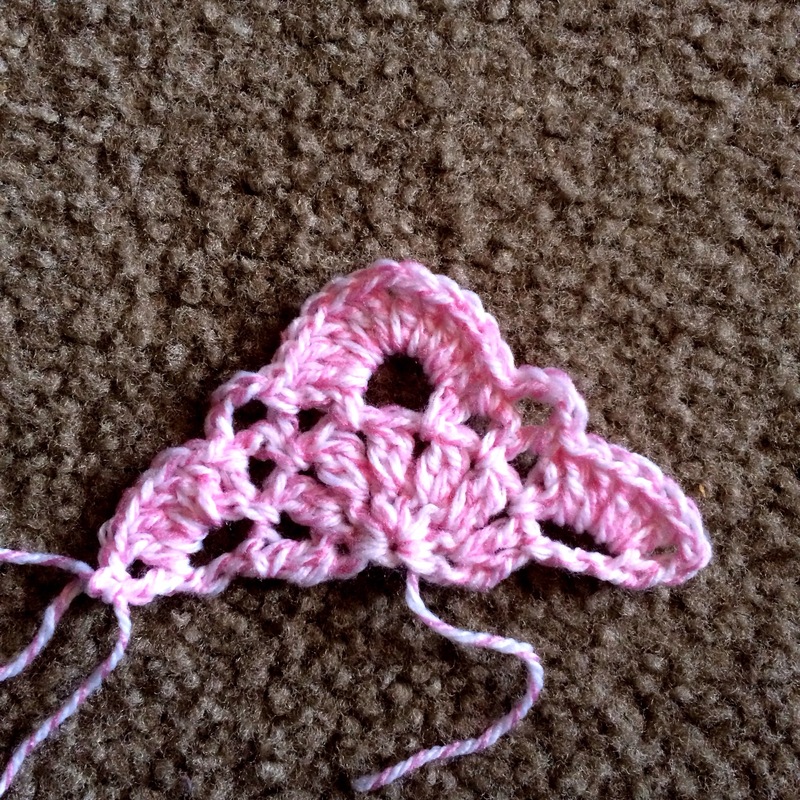 (SC, Ch-4) in same stitch, (TR Cluster, Ch-3) in first chain space. (TR Cluster, Ch-2, TR Cluster, Ch-3) in next chain space 3 times, TR Cluster in final chain space, Ch-2, TR in final DC of Row 2, cut yarn and finish off. TURN WORK. 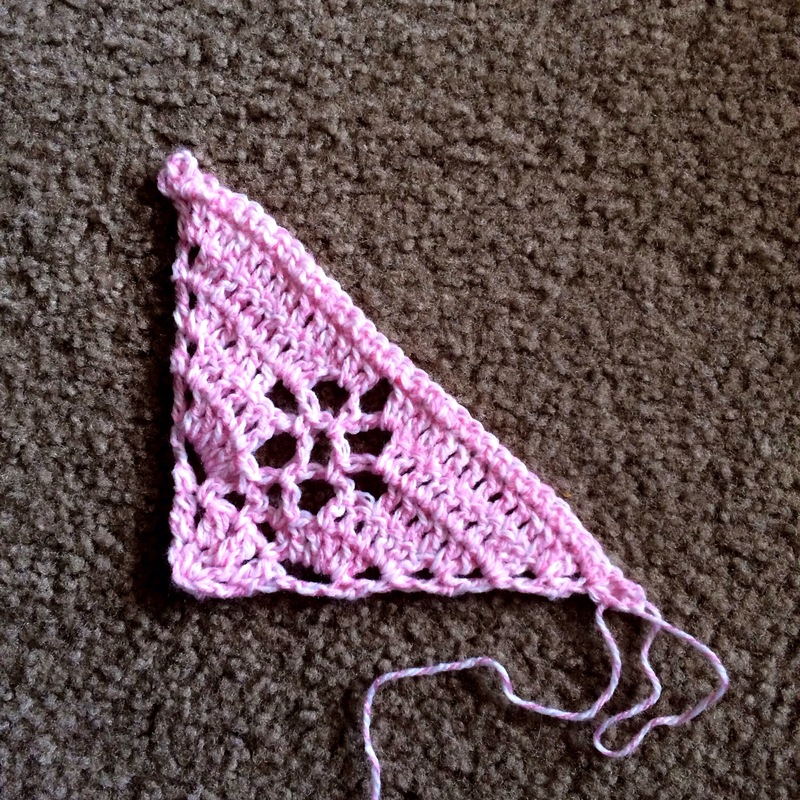 Row 4: Join new yarn in second chain of Ch-4 space of Row below. (SC, Ch-1) in same stitch, 2 DC in first chain space, (Ch-2, SC in next chain space, Ch-2, 5 DC in next chain space) 3 times, Ch-2, SC in next chain space, Ch-2, 2 DC in final chain space, DC in final stitch. Turn work. Row 5: SC in first stitch, Ch-1, DC in next 3 stitches, (Ch-2, 2 DC in next DC, DC in next 3 DC, 2 DC in next DC) 3 times, Ch-2, DC in next 3 DC, DC in final stitch. Turn work. Row 6: SC in first stitch, Ch-1, DC in next 4 stitches, (Ch-2, 2 DC in next DC, DC in next 5 DC, 2 DC in next DC) 3 times, Ch-2, DC in next 4 stitches, DC in final stitch. Turn work. Row 7: SC in first stitch, skip 1 stitch, 7 DC in next stitch, (SC in Ch-2 space, skip 2 stitches, 7 DC in next stitch, skip 1 stitch, SC in next stitch, skip 1 stitch, 7 DC in next stitch) 3 times, SC in Ch-2 space, skip 2 stitches, 7 DC in next stitch, skip 1 stitch, SC in final stitch. Finish off. With right side facing up, attach background color in first SC. Ch-5, 3 DTR in same stitch, skip 2 stitches, ***TR in next stitch, DC in next 3 stitches, 2DCdec over last stitch of this shell and first stitch of next shell. DC in next stitch, SC in next 4 stitches, 2SCdec over last stitch of this shell and first stitch of next shell, SC in next 4 stitches, DC, 2DCdec as before, DC in next 3 stitches, TR, (3 DTR, Ch-3, 3 DTR) in next SC, repeat from *** to final SC. 3 DTR, Ch-2, DTR in final SC. Cut yarn and finish off. 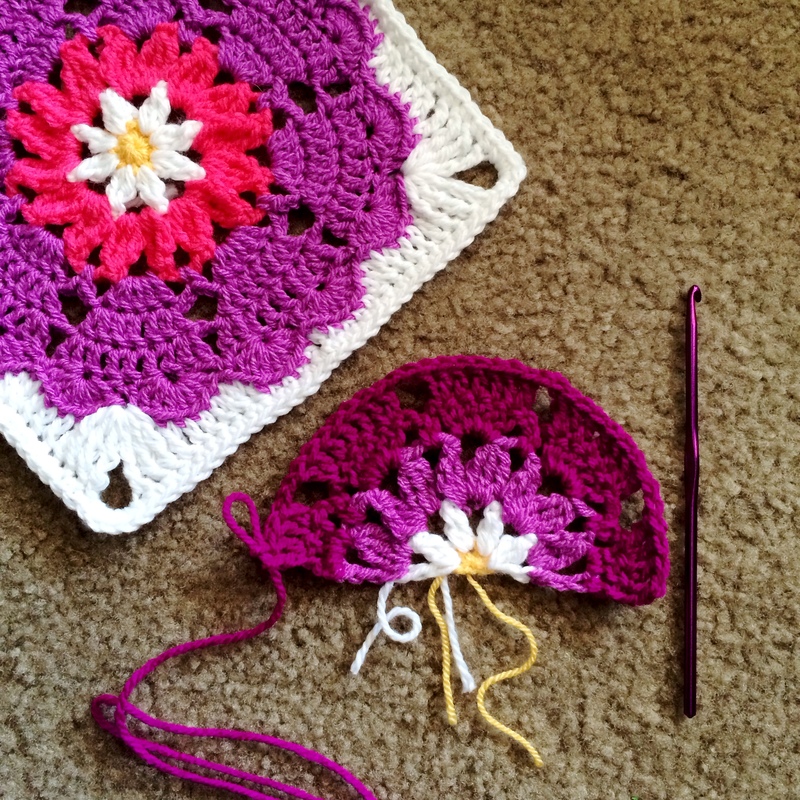 See the post where I square off the original mandala pattern. 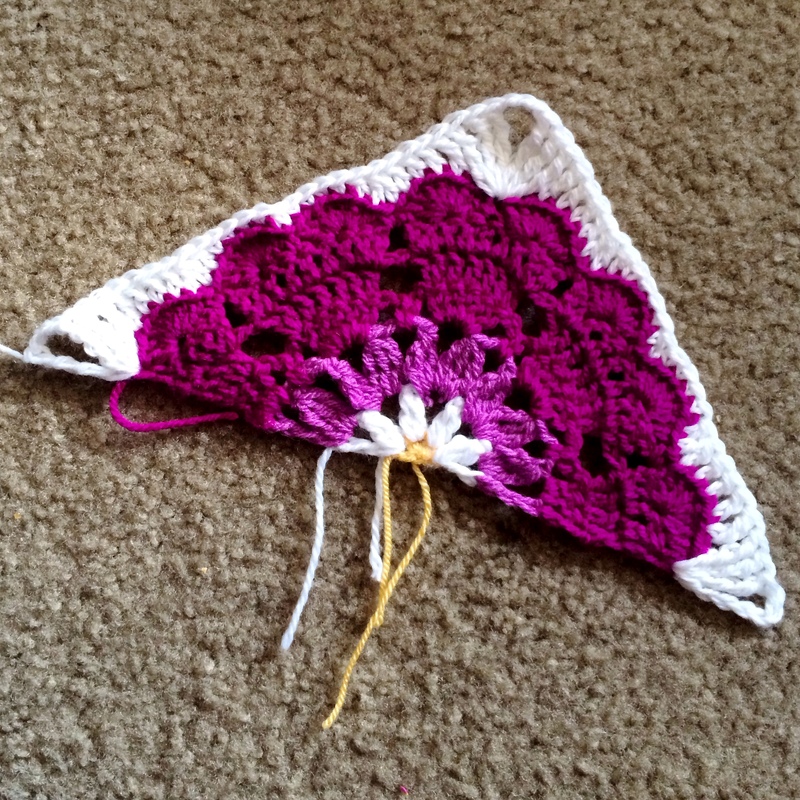 And the Quarter-Square Motif, too! 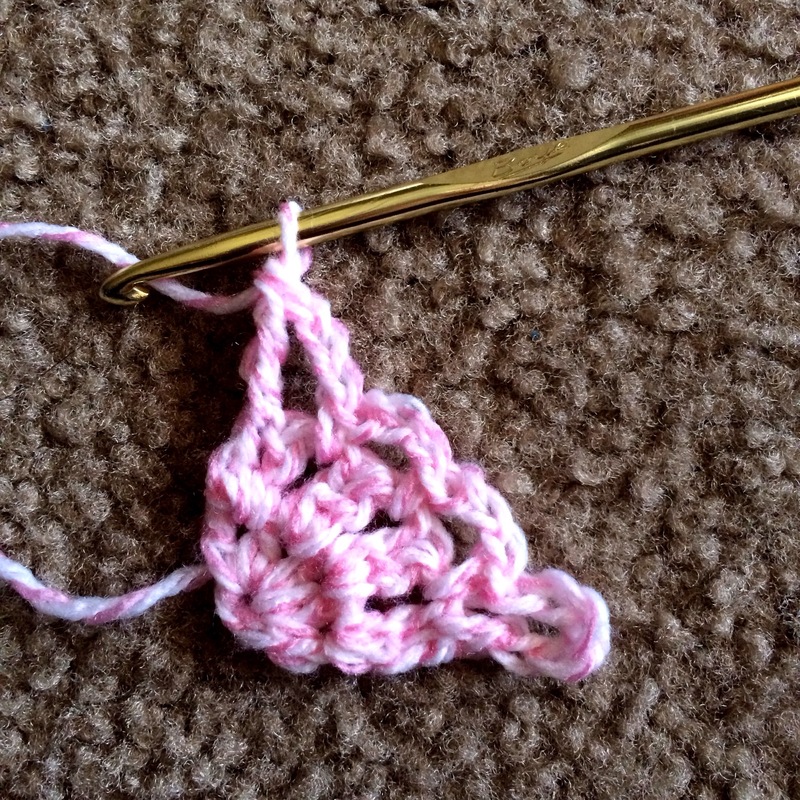 Ch-3 and join with Slip Stitch to make a Ring. Row 2: (SC, Ch-1, DC) in first chain space. Ch-2, (DC2TOG in next chain space, Ch-2) 5 times, DC2TOG in final chain space, turn work. Row 3: SC in first DC. Ch-6, SC in first chain space. (Ch-3, SC in next chain space) 2 times, Ch-7, SC in next chain space, (Ch-3, SC in next chain space) 2 times, Chain 3, TR in final chain of row below, turn work. Row 4: SC in top of TR, Ch-3, 5 DC in Ch-3 space, SC in next chain space, Ch-4, SC in next chain space, 5 DC, Ch-3, 5 DC all in Ch-7 space, SC in next chain space, Ch-4, SC in next chain space, 5 DC in next chain space, Ch-2, DC in second chain from beg SC of row below, turn work. Row 5: SC in top of first DC, Ch-3, 2 DC in chain space, DC in next 4 stitches, skip 1 DC, Ch-4, SC in chain space, Ch-4, skip 1 DC, DC in next 4 stitches, (2 DC, Ch-3, 2 DC) in Ch-3 space, DC in next 4 stitches, skip 1 DC, Ch-3, SC in next chain space, Ch-3, DC in next 4 stitches, 2 DC in final chain space, Ch-2, DC in second chain from beg SC of row below, turn work. Row 6: SC in top of first DC, Ch-3, 2 DC in chain space, DC in next 4 stitches, skip 2 DC, (Ch-4, SC in next chain space) 2 times, Ch-4, skip 2 DC, DC in next 4 stitches, (2 DC, Ch-3, 2 DC) in Ch-1 space, DC in next 4 stitches, skip 2 DC, (Ch-4, SC in next chain space) 2 times, Ch-4, skip 2 DC, DC in next 4 stitches, 2 DC in final chain space, Ch-2, DC in second chain from Beg SC of row below, turn work. Row 7: SC in first DC, Ch-2, 2 DC in chain space, DC in next 6 stitches, 2 DC in next chain space, Ch-4, SC in next chain space, Ch-4, 2 DC in next chain space, DC in next 6 stitches, (2 DC, Ch-3, 2 DC) in next Ch-1 space, DC in next 6 stitches, 2 DC in next chain space, Ch-4, SC in next chain space, Ch-4, 2 DC in next chain space, DC in next 6 stitches, 2 DC in final chain space, Ch-2, DC in second chain above beg SC on row below, turn work. Row 8: SC in first DC, Ch-3, 2 DC in first chain space, DC in next 10 stitches, 2 DC in next chain space, Ch-1, 2 DC in next chain space, DC in next 10 stitches, (2 DC, Ch-3, 2 DC) in chain space, DC in next 10 chain stitches, 2 DC in next chain space, Ch-1, 2 DC in next chain space DC in next 10 stitches, 2 DC in final chain space, Ch-2, DC in second chain before beg SC in row below, turn work. 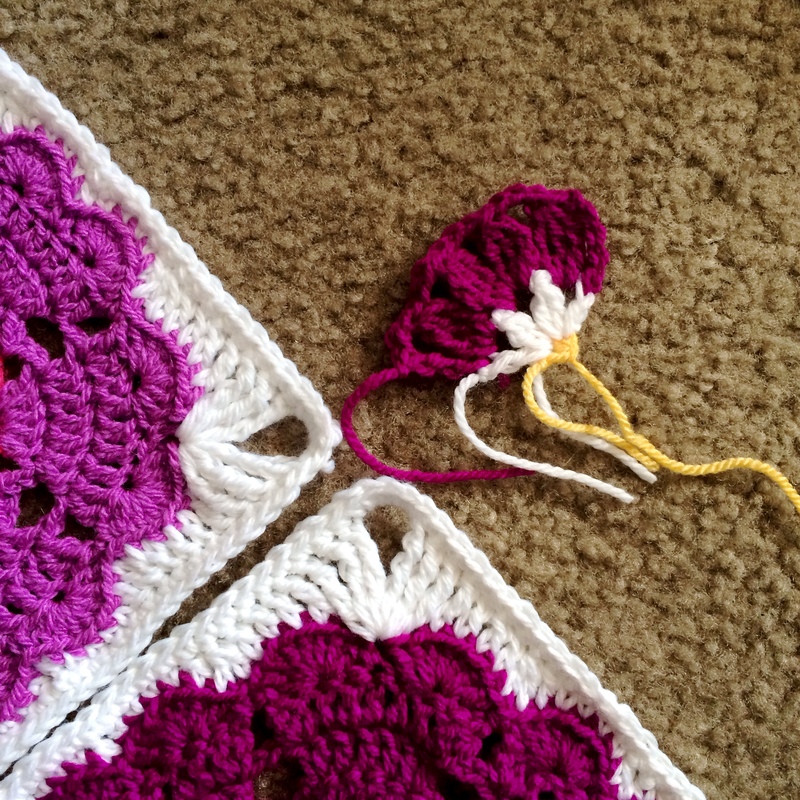 Row 9: SC Ch-3, SC in first DC, SC in all stitches across (including Ch-1), putting (SC, Ch-3, SC) in next 2 corners. Finish off. 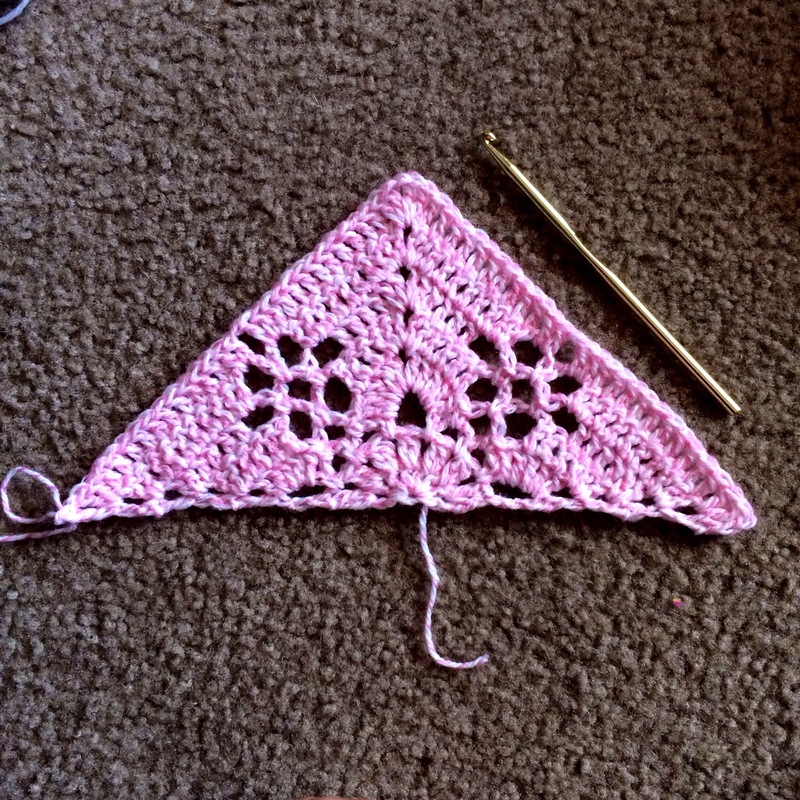 Another way to finish the final row is to cut after Row 8, join yarn with Row 8 facing up as the Right Side, and work Row 9. 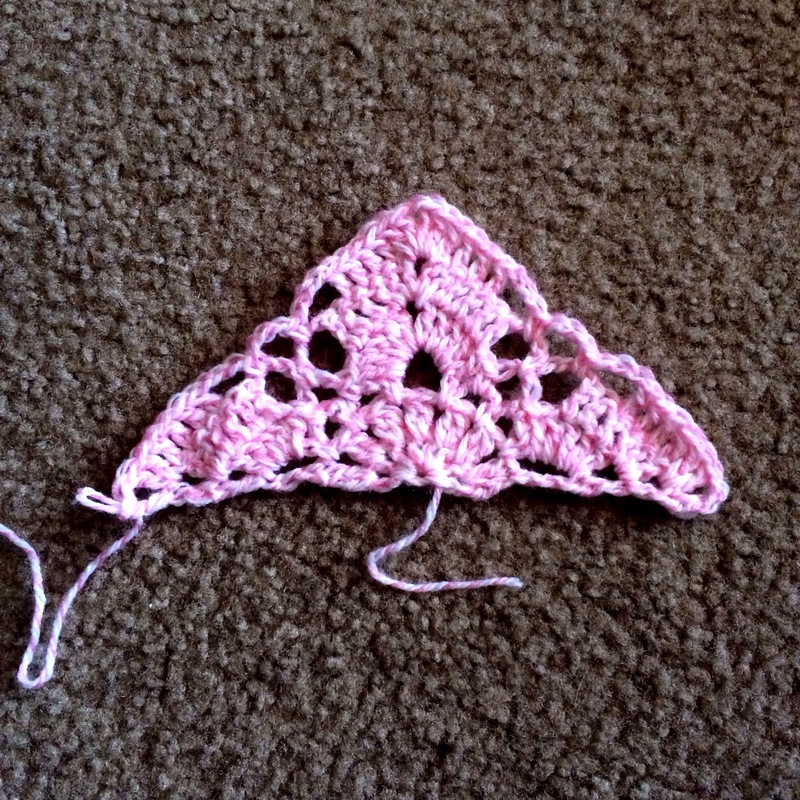 This gives a much more finished look although it adds 2 ends to sew in. 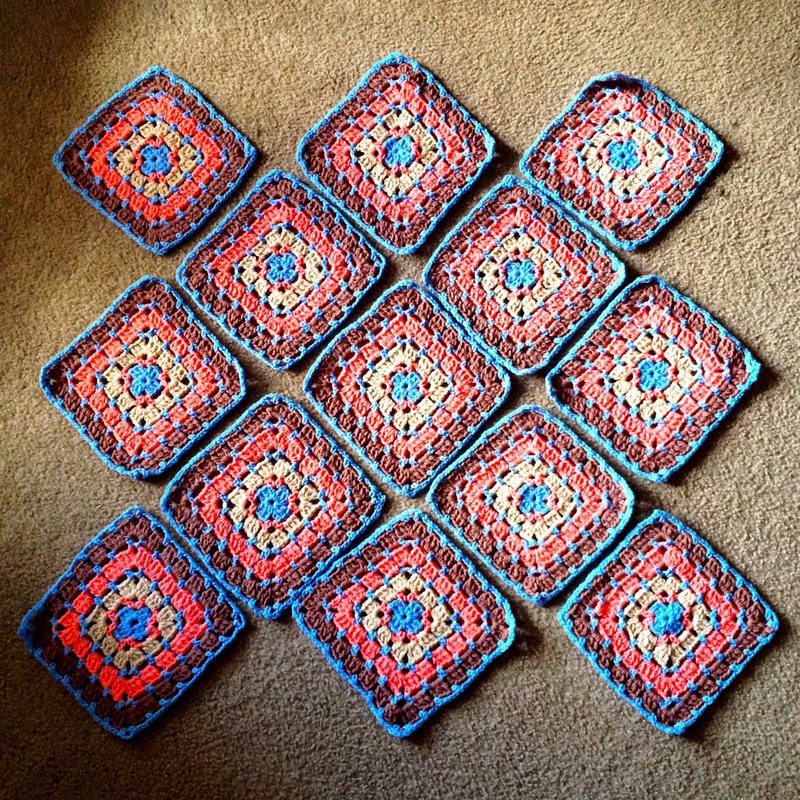 How many Half-Squares do I make?? Your 13 squares, if you are following my pattern, will be arranged in a formation as in the photo below. 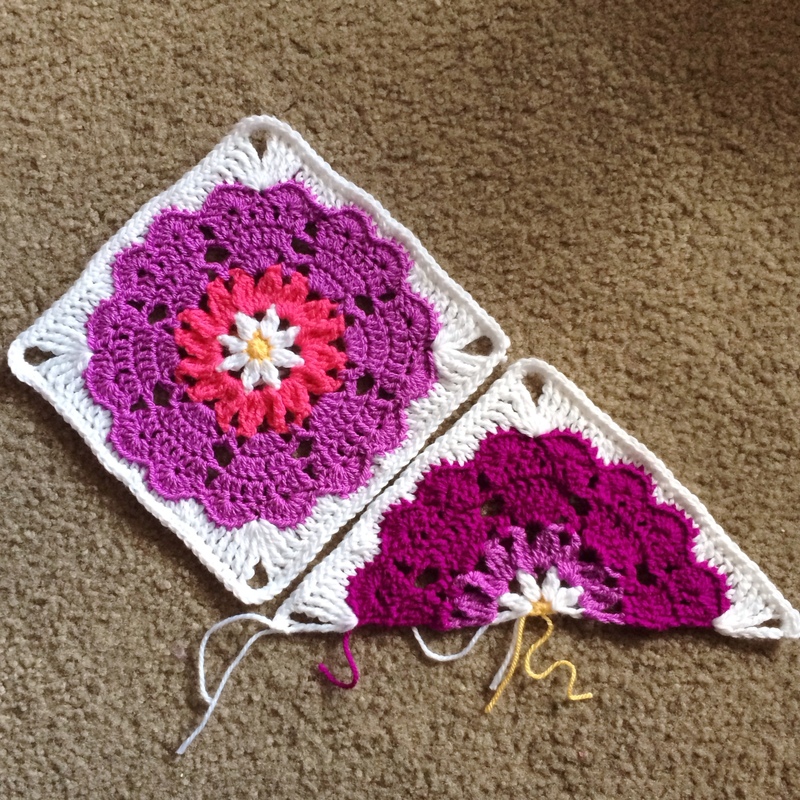 My 13 squares are in laboratory experimentation mode for joining class on Sept 1, so I used some granny squares that I had around! 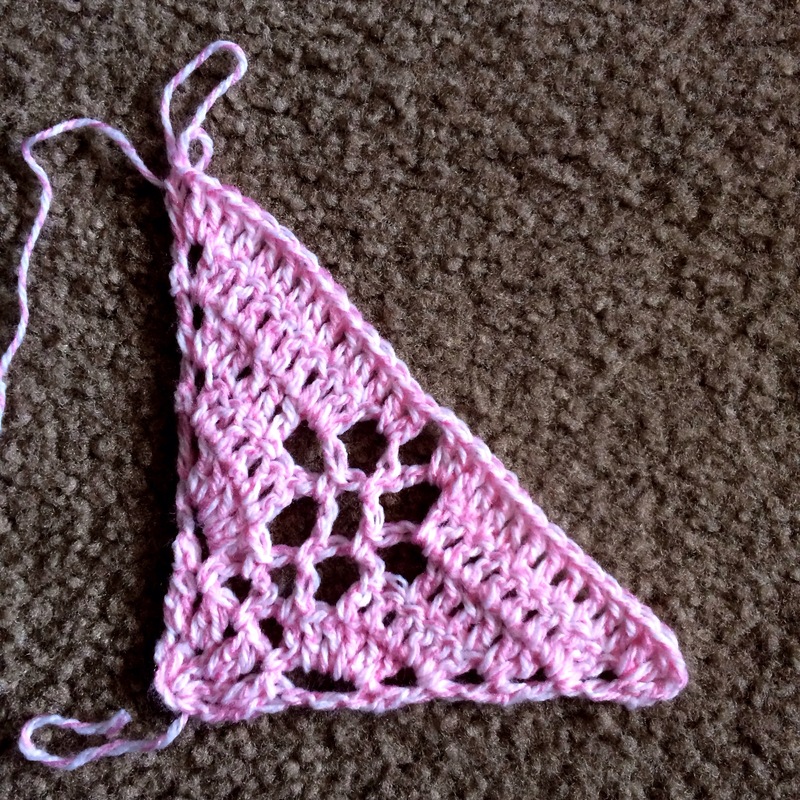 If you’re following my pattern, you have to make 8 half-squares, 2 for each side, as you can see from the half-triangle spaces below. 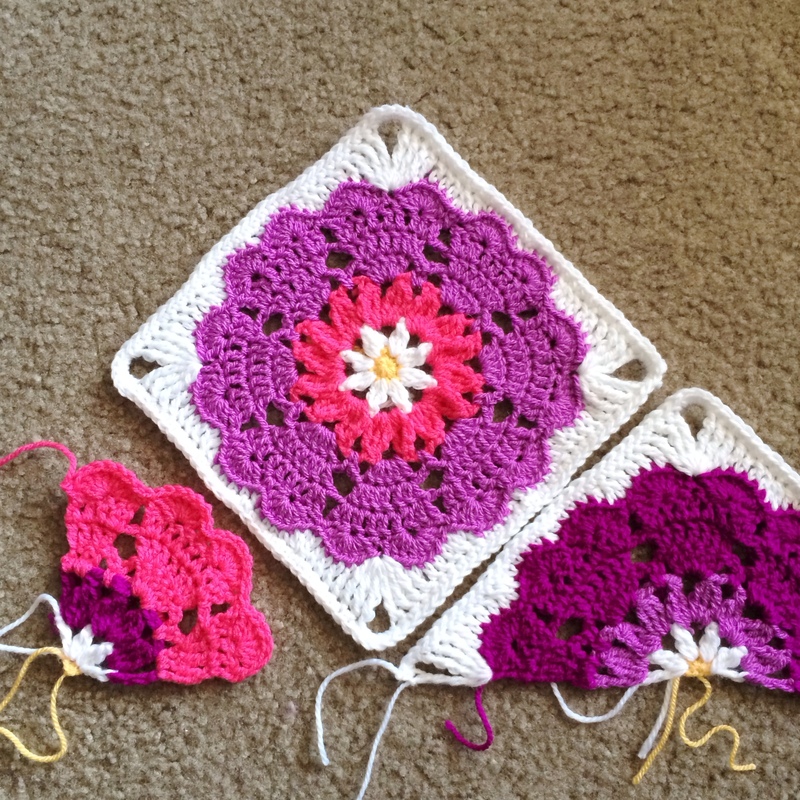 Make as many as you need to fill your blanket spaces! 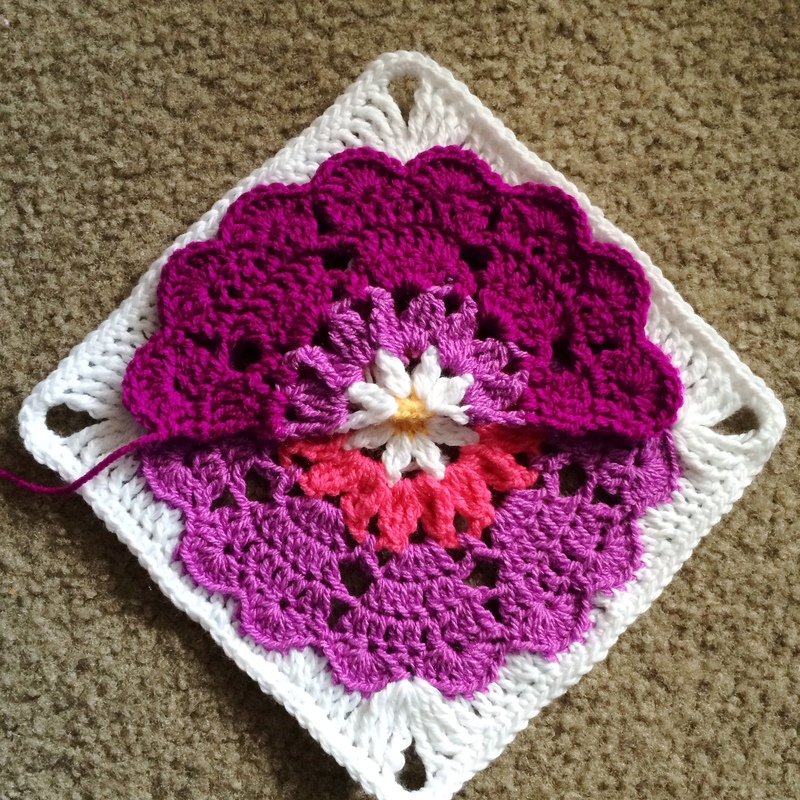 In this li’l round-up, take a look at some of the luscious squares that y’all are starting on! I am just in love and I can’t wait to see how everyone progresses! angelala242 – gorgeous pale colors make this design sing! 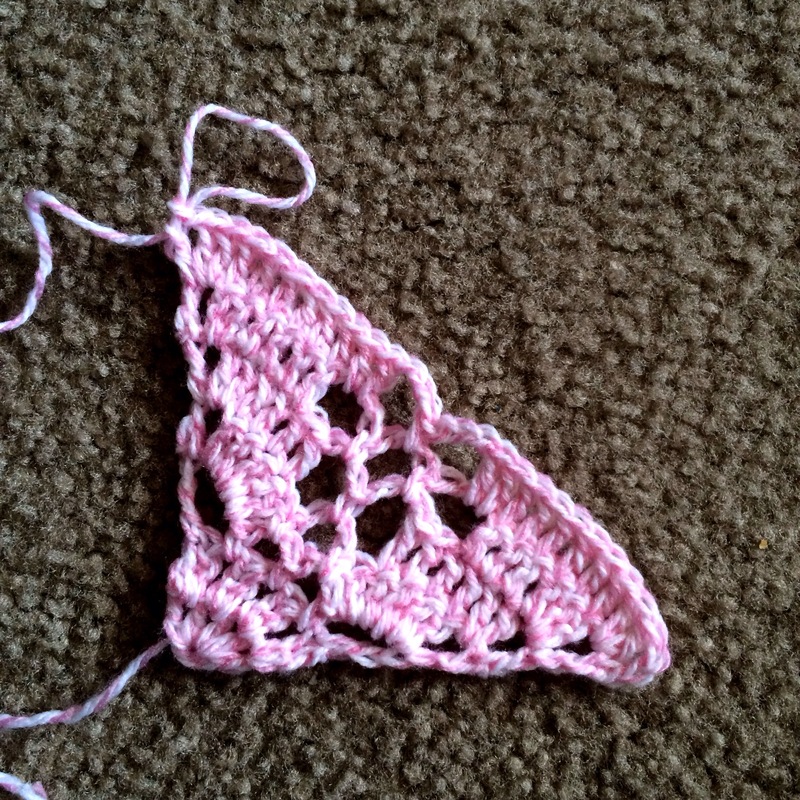 debbbbra – pinkalicious squares are lovely! 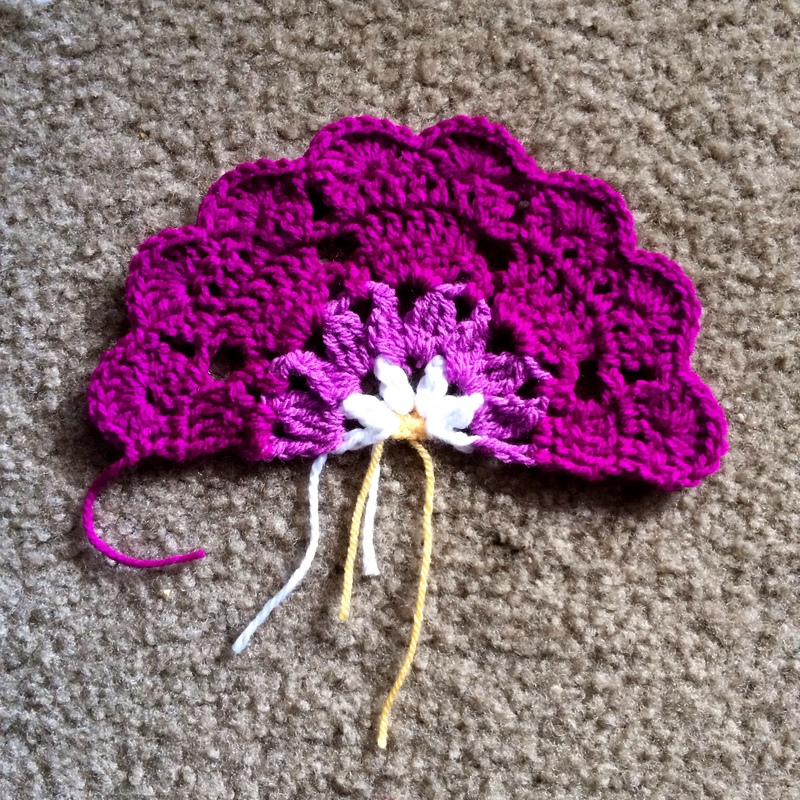 anniedesigncrochet – lush lace with a beautiful flower!